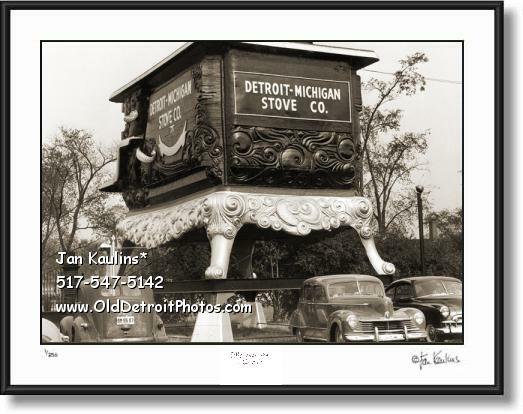 WORLD'S LARGEST STOVE Detroit photo print picture photograph for sale. This sepia toned WORLD'S LARGEST GIANT STOVE Detroit photo picture print is made from the restored Original vintage historical black and white World's Largest Stove photo from early 1950's. The World's Largest stove was premiered at the 1893 Columbian Exposition in Chicago. It was a giant replica of the Garland model kitchen stove built by the Michigan Stove Company. By about 1880 Detroit was recognized as the center for the stove building industry. After The Columbian Exposition the World's Largest Stove was moved to Detroit and placed on Jefferson Avenue at the West side entrance to Belle Isle as a giant tourist attraction. In 1965 the World's Largest wooden stove was moved to to The Michigan State Fairgrounds, where it was dissasembled in 1974 for several years until 1998 when it was reassembled for the 150th anniversary of the Michigan State Fair in Detroit. It was designed by William Keep, weighed 15 tons and stood 25 feet high, 30 feet long and 20 feet wide. This historic (circa 1950's) photo shows the Jefferson Ave. location near Belle Isle. Parked in front of this stove are vintage automobiles, showing the scale of this huge attraction. This stove was destroyed when the entire upper wooden structure burned after it was struck by a bolt of lighting in August 2011. It was a major loss of a historic icon for Detroit and for everyone. Italy has the leaning tower of Pisa---New York City has the Statue of Liberty. Detroit had the World's Largest stove.